1. Draw a blueprint of the perfect man, then downsize it to your minimum requirements, because the ideal man doesn't exist. Once you have the minimum requirements, stick to them. 2. Find a field of work that attracts a lot of men. Good: architecture and chemists. Bad: salesgirl, teaching, librarian and social work, because these fields don't expose you to enough men. "Airline hostess" also is out -- they usually ended up married, but to hometown sweethearts. 3. If you are taken for granted in your hometown, transplant yourself, particularly to the west, where ratios of men to women are better. 4. Attend social gatherings where men are plentiful: dances or conventions for fraternal, social, or professional groups are great places to meet people, but don't discount church socials, adult education classes ("with all of the GIs returning, at least one should pan out"), political organizations, hobby clubs, and sports groups. Stay away from vacation resorts and cruises, as they are overrun by women. 5. Once you have met the man you want, create opportunities for seeing him often. Invent a party -- ask him if he has plans on Friday, because you are having a party at your place -- then, when he agrees to come, call all your friends and invite them over. Speaking of living spaces - get an apartment with a friend or even by yourself. No meeting your new beau at a ladies rooming house or the like. 6. Don't overdress. He may get the idea that your wardrobe taste is too expensive for his budget -- even if half of what you are wearing belongs to your roommate. 7. Don't try to be the life of the party. If your natural role is to be lively and humorous, he may admire it, in which case, go right ahead. But if you have a need to be in the spotlight, you may find yourself alone. Chances are he wants to be the center of attention, so let him be just that, with no maliciously funny or sarcastic jokes at his expense. 8. Don't talk about your job. He may admire your work, but he doesn't want to hear the details. He has work problems of his own and doesn't need to hear yours. 9. Don't alter your personality to suit his, or you will find yourself strangers when you are married, and have to start all over again. 10. Don't make it too obvious that you are looking for matrimony. Be friendly and casual. "Provide just enough moonlight and roses to produce the proper atmosphere" and guide him in the right direction. 11. Don't let your family close in on him too quickly. He will either balk at what he perceives to be a conspiracy, or grab his hat and run. 12. Once you think you have landed him, don't waste time; set the date and marry quickly, lest you find yourself with a man who hangs around for years but doesn't commit. He may need a direct hint like "Mother wants to announce our engagement. Would Sunday the 18th be all right for the family party?" will take care of that. Or invent or dig up another man to start a competitive rush. #12 obviously has totally and completely disregarded #10 and 11, but if he doesn't bolt after a statement like that, he's either ready to go to the altar, crazy, or some combination of both, in my own humble opinion. What do you think? 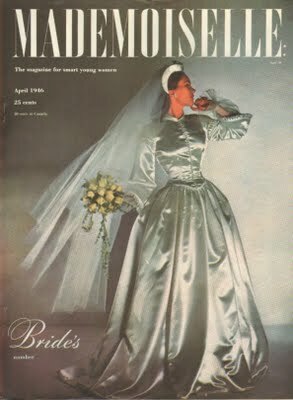 Picture: April, 1946 Mademoisselle magazine. 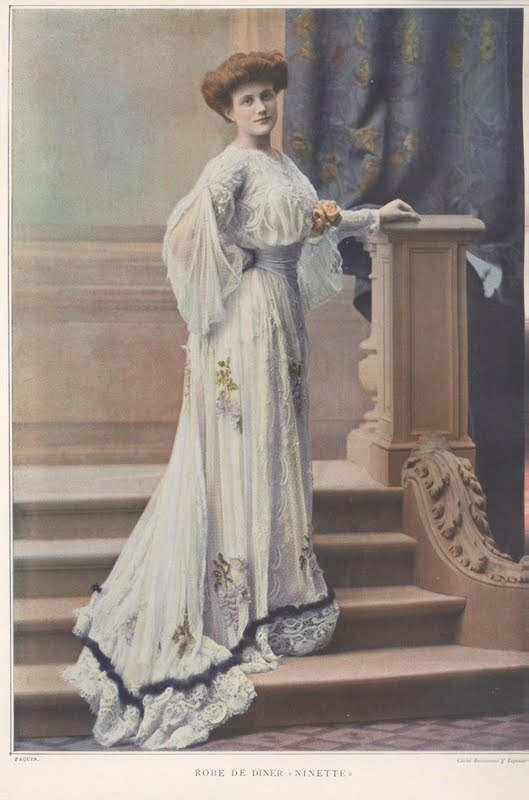 1902 was a year of beginnings, including everything from the birth of Marcel Rochas - who inverted the wasp waist five years before Dior's New Look, the birth of Richard Rodgers, who helped create some of the best musicals of all time, to the fact the Teddy Roosevelt initiated the US Presidents to the car. He was the first president to ride in a car, in 1902. This beauty, a 1902 Pacquin, is simply beautiful. Pacquin loved color and romance, and this example is no exception. By this point in her career, she had been working for a little over ten years, which was midway through her management of the house of Pacquin. 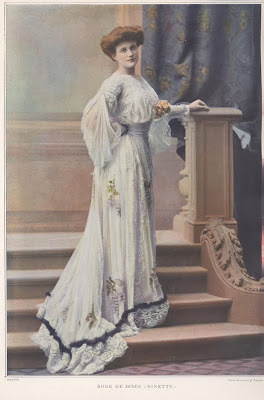 Her husband, Isidore, died suddenly in 1907, and she ran the business alone until 1921, when she retired, leaving the direction of the business to trusted partners. Pacquin ultimately purchased the House of Worth's French business arm. Nonetheless, Pacquin's couture house closed in the mid 50s. Pacquin loved color, many times layering different shades of fabric, then playing with the layers to see how the light would change them. She loved the exotic -- especially the Oriental -- and the bold colors that went along with it. She had a special weakness for fur evening wraps as well. The house of Pacquin had an Argentinian office, and for good reason -- many of her fashions were based on the tango craze. Interestingly, she was also an early proponent of fashion marketing -- fashion shows were not the only way she did it. She sent her models to the races or other social events, wearing her styles, just to get people to look. 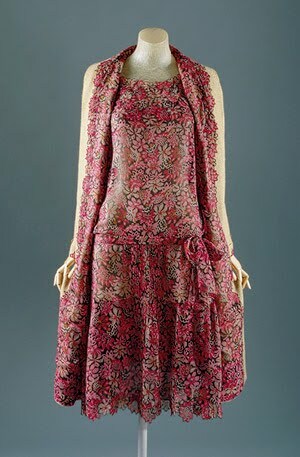 This likely opened the door to others licensing their name, which was made hugely popular when Dior did it in the 50s. Though a top designer of her time, Pacquin has been overshadowed by others over the years. Sad, considering her immense popularity at the time, and her unquestionable eye for the beautiful. Geoffrey Beene's style is lovely to behold, and is so "me." It's full of clean lines, comfort, and it shows off a woman's body beautifully. and the most alluring of all, the back side of the hip, near the waist. This dress, from 1965-1966, is an early one of his designs. Later designs showed off those erogeneous zones to perfection, with wonderful geometric elements and clean lines that didn't muck up the view. You won't find a lot of origami and pleating in his designs. They simply didn't need them. 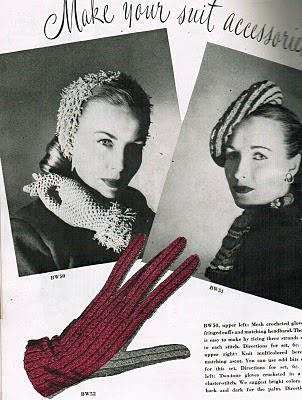 Here's a few more styles of hats and gloves from post-WWII fashion. Note that the cute geometric gloves up top are further evidence that scraps and remnants were still being used to create stylish accessories. The geometric pattern in those gloves could be made with the tiniest bit of leftover yarn. No wonder people who lived through the war had a tendency toward frugality. They earned it. PS Sorry about cutting off the model on the left. I'll see if I can amend that with a better scan. 1946 - it's post-WW2 and the frippery is back, after all those ration years! Note that although you see some extras here - you never would've seen that fringe in the war years - you still see things being made very frugally, with scraps and remnants. "Upper left: mesh crocheted gloves with fringed cuffed and matching headband. The fringe is easy to make by tieing (sic) three strands of yarn to each stitch. Upper right: knit multi-colored beret with matching ascot. You can use odd bits of yarn for this set. Bottom: Two tone gloves crocheted in a simple cluster-stitch. We suggest bright colors for the back and cark for the palm." From Good Housekeeping, January, 1946. I'm reading a book written by John Fairchild. One of the things he mentions therein is that Coco Chanel was the last original designer -- nothing has been original since. Would you agree? 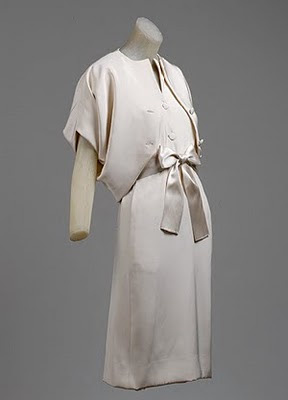 The chemise dress, which unbound women from their corsets and brought on the "little boy" look. Shorter hems - calves were now visible. Cardigan jackets, introduced in 1925. The "little black dress," a timeless staple of fashion, was introduced in 1927 - the same year as this dress. Multiple strands of necklaces, primarily pearls and gold that mixed the real jewels with costume jewelry. Wool jersey as a fashion statement. Quilted purses with gold shoulder chains - and don't forget those interlocking C's. Chanel suits, which incorporate her trademark chain in the hems, to facilitate the creation of the right silhouette. Do you see a trend here of wearing clothing for comfort? Chanel's styles didn't change that much from season to season, but what she did create was wearable clothing that was comfortable, casual, and stylish. What do you think? Was she the last original designer? Discuss.